Ever wonder what it would be like to feed a giraffe? Or ride a camel? Well you can soon do that in Columbus! One of the most anticipated new things to experience this summer is Heart of Africa at the Columbus Zoo and Aquarium. The 43-acre region opens May 22 and will immerse you in an up-close, experiential adventure of Africa. Heart of Africa is home to 130 animals representing 20 species. Visitors will encounter lions, cheetahs, ostriches, wildebeest, gazelles, vervet monkeys and many, many more! Camel Rides Upon entering Heart of Africa, you’ll meet dromedary camels and have the option to take a camel ride. Cheetah Runs Cheetahs, the world’s fastest land animal, will display top speeds as they race across their yard at various times during the day. Lion Experience Get up-close and personal with lions as they board an abandoned Beech-18 transport plane. The plane has been modified to allow you to safely come face-to-face with the Zoo’s lions. 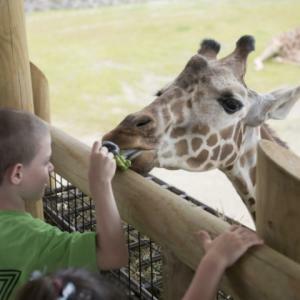 Giraffe Feeding Your journey through Heart of Africa culminates at the giraffe yard. Come face-to-face with these long-necked herbivores and even feed them! Turn your Heart of Africa adventure into a getaway! 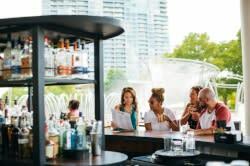 Get admission to COSI, Zoombezi Bay and overnight accommodations all for one low price with the Roar & Explore Package. Start planning your trip at columbusfamilyfun.com.